Chesterfield driver Seb Perez started the new Porsche Carrera Cup GB season as he means to go on with pleasing top-four positions in the two races at Brands Hatch. 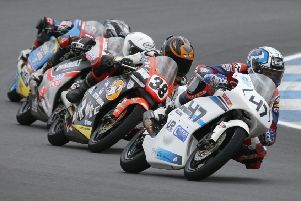 Competing in the pro category for Amigos Redline Racing, the 19-year-old Perez made the podium in the opening contest, which was televised live on ITV 4. And he followed up with fourth in the second race, which was won by his teammate George Gamble. He said: “To come away with third and fourth places, I am pretty happy. We showed in both races that we have the pace to be right at the front. The opening race had a curious twist to it because it was delayed for two hours by thick fog rolling in early morning and lingering over the Kent Indy circuit. But once it got under way, Perez started in his usual style, storming around the outside at Paddock Hill to improve into third and soon taking second spot. He topped speeds of about 130mph and his attack was only slowed down as he lapped some of the back-markers. Not until the 29th of the 34 laps did he drop back to third. Perez also made a flying start in the second race before losing some momentum and dropping from second to third and then fourth. He kept on the pace for the next 23 laps and could be content with a well-driven display in a hard-fought battle. The Chesterfield teenager now goes to Donington over the weekend of April 27 and 28 in fourth position in the pro category standings with 13 points. Amigos Redline Racing top the team standings with 64 points already in the bag. This year’s Porsche Carrera Cup GB is one of the most highly-regarded championships in Europe. After Donington, it moves on to the Croft circuit in Dalton-on-Tees, Darlington over the weekend of June 15 and 16.